For the first few minutes I thought I was going to get another Linda Linda Linda, as a group of slackers performed some very bad karaoke in matching costumes, wearing bowler hats that seemed to reference A Clockwork Orange. 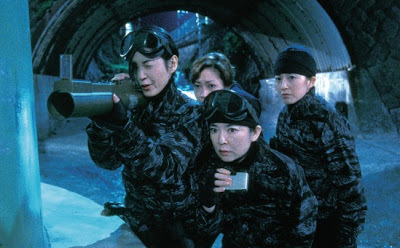 But the story soon kicks off when one of their group randomly murders a middle-aged woman on the outskirts of Tokyo. It's nasty, but with just a little too much gushing blood to be totally serious. It turns out that the victim's friends are also fans of karaoke, and not above resorting to bloody vengeance, if they can track him down before the police do. It was a while before I figured out this was in fact a satire. Problem being I wasn't getting all the humour. The story of the escalating battle between the middle-aged divorcees and the young slackers isn't quite as important as the contrast between the two sides, their attitudes, lifestyles, and just as importantly, their tastes in music. 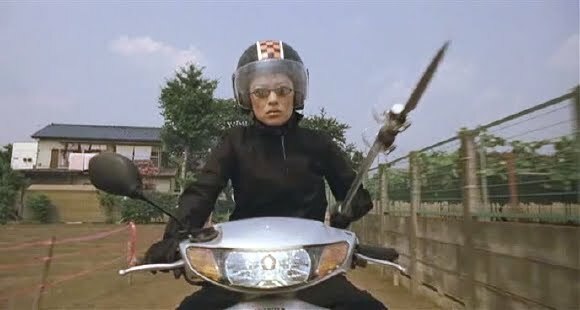 This is based on a novel by the author Ryo Murikami, no stranger to controversy as he exposes attitudes lurking in the big cities. He also wrote the infamous Audition, which notably excludes any humorous streak. The story still gripped me, and while I enjoyed the characters and the brilliant cast, I was very aware of repeatedly missing the point of the choices of music and many cultural references. Each actor in the ensemble cast carves their own very clear characters. The women are just as immoral as the men, while justifying their crimes in different ways. 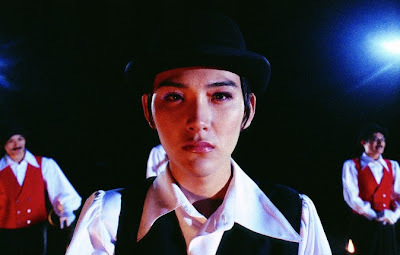 I only knew the intriguing Ryuhei Matsuda from Nightmare Detective, Otakus In Love and Gohatto. 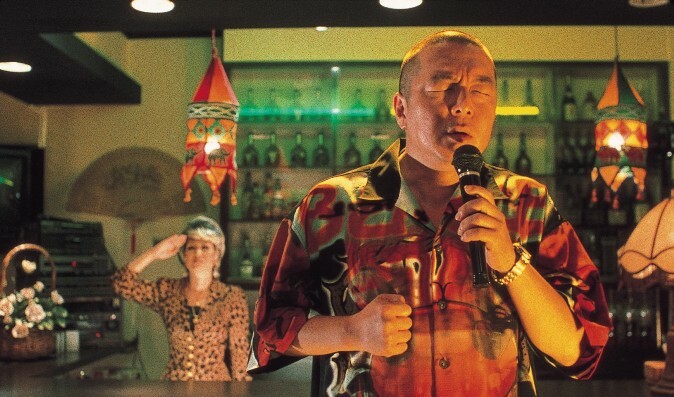 A more experienced actor than the rest of the guys' group, he still modestly blended in completely here. While looking like modern Japan, this presents a gallery of skewed and surreal characters, like Twin Peaks with an agenda. 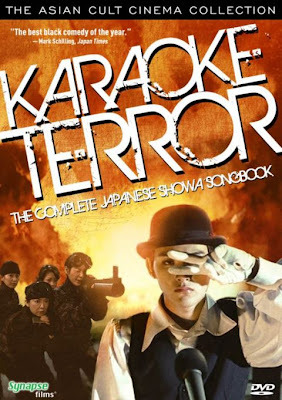 Karaoke Terror is available on DVD from Synapse Films in the US (see cover art at top). It includes extensive liner notes with a guide to the 60s pop songs featured in the film, a trailer and a good 20 minute 'making of' feature. That sounds really interesting! I'm guessing it was just the cultural difference that made the joke hard to understand? With a name like Karaoke Terror...I have to check this out! Love the Clockwork Orange refs. Definitely I missed a lot of the humour. But it's fun trying to work out the targets they're aiming at. Thank you for the comment, it's never too late to comment on older reviews. You're welcome. They were going for a "British" image, I reckon (the Beatles and the Stones etc. were massive at the time). The catch copy for that first record was (if I remember correctly) "Ereeto saundo '68: oshare musume to kizoku yaro!" Which I would translate as "The Elite sound of '68: Fashionable Chick and Aristocratic Bastards!" Pretty damn cool.